I got an email inviting me to audition for a show filled with lies. For the audition, I have to tell a three-minute lie, as outrageous as I like. How hard can that be? So I accepted and figured something would come to me. But now the audition is just days away and I’m starting to panic. I’ve come up with two so far, one about a friend’s strange restaurant behavior and one about accidentally killing my piano teacher. Both sound good in my head, but when I start telling them out loud, I trail off. I lose my sense of purpose, which at least tells me something about why I like true stories, even when they’re not outrageous. They’re true, so they reveal something about something, even if I don’t always know exactly what the something is. But what does lying reveal? So far, I’ve lied only to hide things. But then again, a lie is just a fictional story and I’ve written those, so this shouldn’t be any different. But it is. I’m thinking about cancelling my audition, but I don’t want to chicken out. Last night my brother Rolando came over. His friends have opened a hardware store, Matty K’s, and we were going there for a sort of gardening pep rally. Rolando came early to bring us gifts of dog food. Their dear old family dog passed away last month, so they had boxes of treats and bags of food which I coveted. My plan was to pass it on to Zoe’s new owner, because the Katharine Hepburn of Horner Park has also passed on, and Zoe was now living with one of the B’s. There are two B’s, B-e and B-y. For months we’ve emailed each other to schedule Zoe’s walks. We’ve also tried to plan a dinner together, because the Hepburn sisters gave us checks to dine at Blackbird, as a Zoe thank you. We’ve tossed dates around and B-e even made reservations twice, but something always comes up. Yet when Miss Hepburn died, we found ourselves suddenly able to wrangle ourselves and husbands and bottles of beer and whisky for pizza at a local BYOB. It was soon enough after Miss Hepburn’s death that it didn’t feel real, and we had a boisterous time. I planned to email B-e and tell her I had food to pass on for Zoe – it’s even her brand – but B-e had already emailed to say she’d brought Zoe back to live with Miss Hepburn’s sister. She convinced her that we didn’t mind continuing the walks, and Zoe is good company and good protection. So in a little while I’ll go over and pick her up for a walk. But first, I need my lie. Last night, after Rolando parked the car and we had dinner, we walked over to Matty K’s. We passed a man dressed in a plumed page’s costume. He looked exactly like a royal chicken, with a plumed headpiece and puffy satin middle and tights. I wished I had my phone out, but he didn’t look like he would appreciate a picture. He was smoking a cigarette and adjusting his headpiece. We continued on to the store, where we had cookies and root beer and got fired up about gardening. 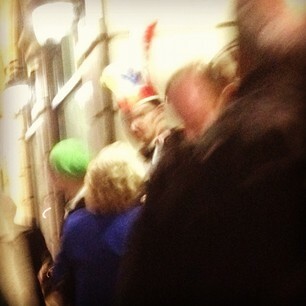 When we left, the royal chicken was still standing on Western, greeting people going into an event. If this were a lie, something outrageous would happen right here. But because it’s true, all I have is a blurry picture, because I grabbed my phone in time but didn’t stop to focus because I was afraid of getting yelled at. I don’t know if I’m cut out for lying, if I don’t even have the nerve to get a decent picture of an outrageous apparition placed right in my path like a golden egg. there was no chicken. you killed a piano teacher. your friends never demonstrate strange behavior in restaurants. miss hep burn is enjoying a long summer walk at Horner park with Zoe. and you really do have a brother called rolando. he sings with Tony and dawn. If it is but I tell you it’s not, does that negate the whole thing? If you tell a true story and say it’s a lie, does that count? I’m really glad you got the chance to meet Miss Kate and to pass along some love and deliciousness to both of them. I am so saddened to hear of Kate’s passing. Although I did not know her well, she was outrageous and funny, challenging and incredibly loving wrapped up in one little package. I keep her sister in my thoughts and prayers. Zoe will be good company for her. A soft head to pat and a warm body by your side often dulls the chill of reality. As for the lie? Good luck with that one! Have you ever told a lie that spiraled out of control? Because that would make an awesome story. I did that once, when we moved back to Chicago. Not sure why even. Somehow it seemed easier than telling the guys I worked for the truth, that we just didn’t want to be in Kansas City anymore. But the lies that had to be piled on top of lies to keep it all going made it complicated to remember. What was the lie, maybe MT can use it! I told them Kate got into graduate school in Chicago, but not just a regular grad program, but more like a work study internship kind of thing. By the time she finished real graduate school, they thought she’d been in grad school for like 10 years. Or they didn’t believe me at all. Lies are like that, they seem compelling and real to the teller. Often seen through for the lies they are by the audience, I’d guess. Yeah, there is that uncomfortable feeling when I think someone’s telling me a lie and I watch them talking themselves into it. A strangely private moment, and no one is fooled but the teller. It just occurred to me that this is all very much like going to the Dark Side in Star Wars. Once you go down the path, it’s hard to turn back. Also, maybe you don’t prepare a lie ahead of time. Might make it more realistic. Just a thought. I like that idea best so far. Maybe i’ll just ask for a suggestion. You could tell a long elaborate lie about how you didn’t prepare a lie for the audition. That might be completely hilarious.